I feel like I’m pretty up on the push for green jobs (creating jobs in the building and installation of wind turbines, construction of energy-efficient buildings, etc.) but this morning at the APHA meeting, I learned something about the occupational health angle of this movement. At a session from the Blue-Green Alliance, Walter Jones of the Laborers’ Health and Safety Fund of North America and TJ Lentz of the National Institute for Occupational Safety and Health spoke about making green jobs safe jobs. So far, it seems that the shift toward greener buildings hasn’t done much to make the construction or maintenance of these places safe for workers. (One positive point is that the use of safer paints and solvents can reduce workers’ as well as residents’ exposure to fumes.) Designers of buildings don’t generally pay much attention to the ways that their plans will affect the way workers interact with them, and design schools don’t tend to include occupational health and safety in their curricula. Jones noted that between 1990 and 2003, 42% of all US construction-related fatalities were linked to design. Problems include a lack of anchor points for workers to tie off to when they’re working off the ground, and parapets that meet building code requirements (being at least 30 inches high) but not OSHA requirements (39 to 45 inches). When it comes to wind turbines, fall protection is also crucial, and the inside of the tower is a confined space – but designers rarely address anchor points or tower access and ventilation issues. Occupational health and safety advocates are working to get safety issues on designers’ radar. The American Association of Safety Engineers has begun working on a standard to protect workers involved in windpower facilities, and NIOSH runs a Prevention Through Design program. As we all throw our support behind green jobs, we should make sure that “green” includes worker health and safety. I completely agree. For example, LEED criteria are silent on the safety and health of the people who build the ‘green’ building. 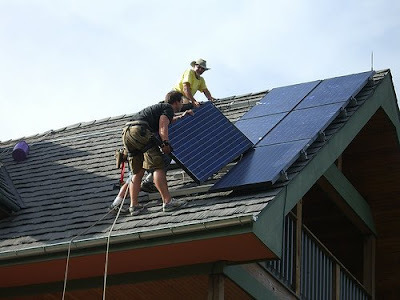 Solar installers in particular generally don’t seem to use fall protection, see http://3.bp.blogspot.com/_gSleJe6YsA0/Sdw6KO3MMhI/AAAAAAAAAMI/wgI3PSS95C8/s400/Solar+Installer.jpg or http://www.sfgate.com/cgi-bin/object/article?f=/c/a/2009/01/26/MNSI15G378.DTL&o=2 for examples. The lack of attachments on almost all roofs makes fall protection difficult for the committed and easy to forget about if you are unaware.